"See what you believe... become what you see." As Catholics, we believe the Eucharist truly is the Body and Blood of Jesus. We believe this because Jesus said so, Himself. In Chapter 6 of John's Gospel, Christ tells us, "I am the living bread that came down from heaven; whoever eats this bread will live forever; and the bread that I will give is my flesh for the life of the world.” He then says, “Amen, amen, I say to you, unless you eat the flesh of the Son of Man and drink His blood, you do not have life within you." The disciples had a hard time believing this and walked away. Jesus did not stop them to say that they took Him too literally, nor did He say they misunderstood Him. He repeated it again. Every time we go to Mass, we celebrate in thanksgiving (which is what the word Eucharist means! ), that Jesus gave us the opportunity for salvation by shedding His body and blood on the Cross. 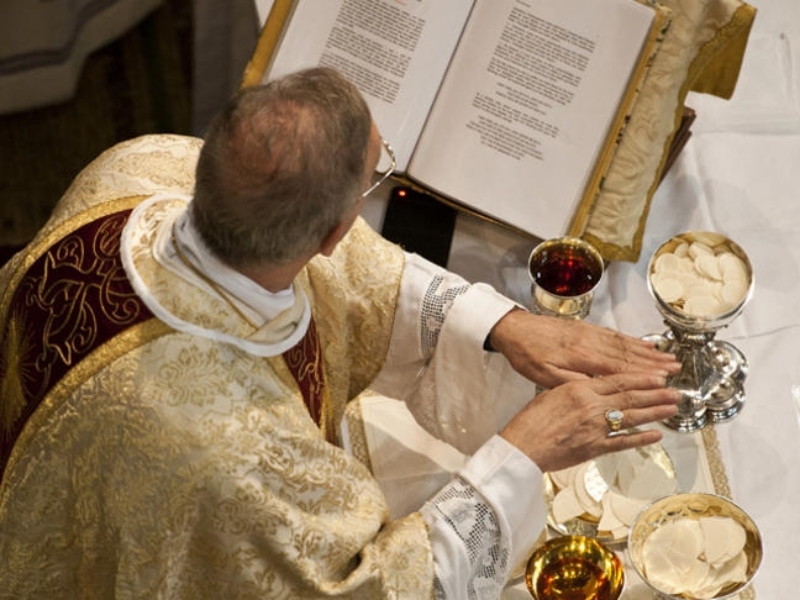 We believe we are made present at the very sacrifice of Christ on Calvary at every Mass, which is why we often refer to it as: "The Sacrifice of the Mass." The Eucharist unites us with one another in community, and it strengthens us on our journey to the kingdom. Like all sacraments, it is a sign that God is with us on our pilgrimage. St. Augustine said "Believe what you see, see what you believe and become what you are: the Body of Christ." When we say "Amen", we are saying "Yes! I believe this is the Body and Blood of Christ and that I will be the Body of Christ to others." Are you interested in preparing for First Holy Communion? Adults can study for Initiation into the Catholic Church through our RCIA program. Learn more here. Are you interested in helping at Mass? St. Augustine Parish is always looking for additional Extraordinary Ministers of Holy Communion. Learn more here.